Located near the intersection of McLeod Rd NE and Jefferson St NE, Extra Space Storage serves Albuquerque residents near Arroyo del Oso, Los Ranchos de Albuquerque, North Valley, and more. 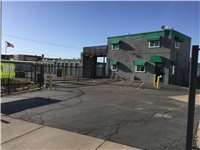 Locals will recognize our facility next to Maaco Collision Repair. With a wide selection of storage units, drive-up access, and exceptional security, Extra Space Storage on McLeod Rd NE can accommodate residential and commercial storage needs in Albuquerque! Units at our Albuquerque storage facility come as small as 5x5 and as large as 20x20 with features like first-floor access and drive-up access. No matter what you need to store, we have the space for you! Extra Space Storage cares about providing a safe storage environment and peace of mind for our customers. That's why our McLeod Rd NE storage facility utilizes advanced security measures like electronic gate access and 24-hour video surveillance. McLeod Rd NE between Jefferson St NE and San Mateo Blvd NE. Drive south on I-25 S. Take Exit 229. Turn left onto Jefferson St NE. Turn left onto McLeod Rd NE. Our facility will be on your left after Maaco Collision Repair. Drive north on I-25 N. Take Exit 229. Turn right onto Jefferson St NE. Turn left onto McLeod Rd NE. Our facility will be on your left after Maaco Collision Repair. Drive west on Montgomery Blvd NE. Turn right onto San Mateo Blvd NE. Turn left onto McLeod Rd NE. Our facility will be on your right after Enchantment Carpet. Drive east on Montano Rd NE. Turn left onto Pan American Fwy NE. Turn right onto McLeod Rd NE. Our facility will be on your left after Maaco Collision Repair.